The most pertinent criticism that could be made about We Are The In Crowd was that they often struggled to find one solid identity. Of all the acts lumped with the knee-jerk Paramore comparison simply for having a female singer, it was probably the most justified to We Are The In Crowd; Tay Jardine was a lot like Hayley Williams in terms of vocal power, and their move to poppier material on 2014’s Weird Kids came only a year after Paramore did the exact same thing on their self-titled album. After a somewhat inevitable fizzling out then, SAINTE comes as a means of a new start, led by Jardine alongside guitarist Cameron Hurley and bassist Mike Ferri for a more liberating, personal project. In that respect, smile, and wave does everything it needs to as a debut. It’s as polished as it gets and it arguably isn’t far enough divorced from We Are The In Crowd to stand independently as its own project, but it already represents a more crystallised personality beginning to develop. This is pop art with heavy emphasis on the “pop”, coming in both the garish, colourful aesthetic and the fact that Jardine’s delirious optimism and energy beams through almost every pop-rock power chord and synth flutter. That’s why Lighthouse is perhaps the weakest song here, dropping the pace for a downbeat, stodgy ballad that shoots for Disney-style melodrama and drains the colour and spark that the rest of smile, and wave establishes as par for the course. SAINTE are far better when they go full pop-rock, taking the flimsy, underweight framework Against The Current popularised and employing some cleverness and charisma to improve it exponentially. The sprinklings of electronics on Technicolor and Feels So Wrong don’t immediately drown out any real guitars, and even if they can feel slightly thinner than would be ideal, there’s punch and drive there regardless. It’s definitely appropriate given how this EP pans out lyrically, embracing change and making the best out of a new situation. And really, if Jardine was a weaker vocalist, this would have nowhere near the clout that it does. Toeing the line between relentless pep and having the sugar-coated power necessary for this sort of pop-rock, the joy and buoyancy feels all the more genuine, whether it comes in breaking out of a toxic relationship on With Or Without Me and White Lies or simply having the courage and confidence to step into the unknown on Eyes Are Open and If You Ever Feel Alone. Excessively sanguine as it may be, it’s a lot more believable here than when so many other bands throw it out as a perfunctory measure. That’s the beauty of SAINTE finding a definite identity for themselves, in that any through line is so much easier to piece together, and it’s already a far more cohesive listen. That’s not to say that SAINTE are a fully-formed entity just yet; it still remains to be seen how far they can go with pursuing a sound as rigid and greatly defined as this. But for the time being, smile, and wave is a positive start, both in its own outlook and how it paints SAINTE’s future endeavours. With all the growth that is bound to take place, who SAINTE are as a band will only become clearer in time. 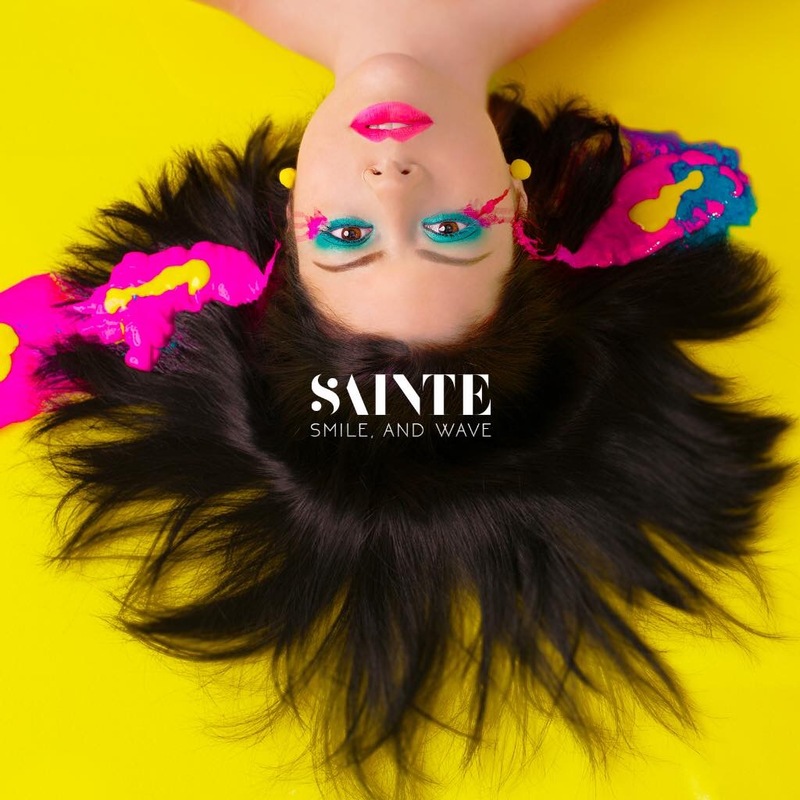 ‘smile, and wave’ by SAINTE is out now.